Take a trip to nearby Barcelona for something different! Calella, where Med Playa has one hotel, the three-star Hotel Santa Mónica, is the tourist capital of the Maresme region. With thirty-nine kilometres of sandy beaches, the Barcelona Coast has a magnificent coastline, which when added to the local experience in tourism and in the management of natural area provides a first-class destination for leisure and enjoyment. The scenery is reminiscent of the Costa Brava with its sharp-edged wave-pounded cliffs and its lonely 150-year old lighthouse. Around the neo-classical Church of Santa Maria, parts of the old town dating from the 14th century are still conserved. The Dalmau Park and the forest paths leading to different parts of Montnegre are great for those who love walking. This resort town has a three-kilometre-long sandy beach, plenty of things to see and do during the day, and an absolutely fun-packed nightlife. The coastal and mountain natural areas allow visitors the opportunity to practice watersports such as sailing, diving and water-skiing and country-based activities such as hill walking and cycling. The Maresme region offers a perfect setting for the practice of all sorts of nautical, mountain, and adventure sports. The nature reserves of the Serralada Litoral, Montnegre and El Corredor are mountain areas of great interest for their fauna, flora and heritage. Over 20 species of mammals, 10 species of reptiles and 200 species of birds can be found there along with the remains of Iberian hamlets, dolmens and other prehistoric monuments. The musical, theatrical and folkloric traditions of the Maresme form the framework for a rich cultural life. Gastronomically speaking, the area is well supplied both by the sea and the fresh local produce. Amongst the best-known products of the area are the strawberries from Alt Maresme and the wine of Alella. When you add to this that the Costa Brava is just one step to the north and Barcelona just one step south, you realise the possibilities are endless. 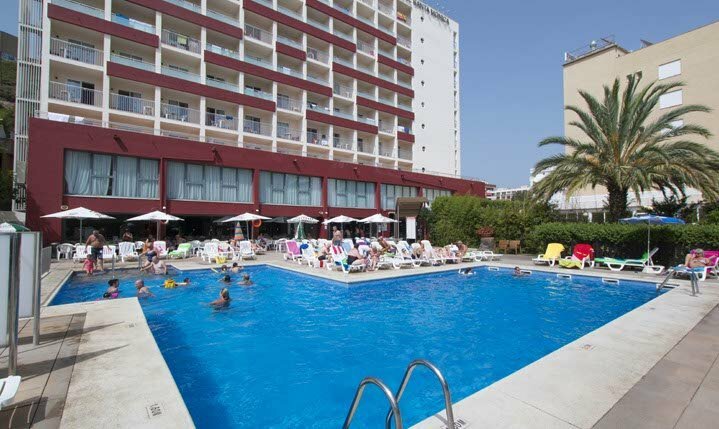 The popular Hotel Santa Monica in Calella is a three star hotel, just a stones throw from the beach and the resort centre where you can explore typical shopping streets or enjoy the night life. Our comfortable air-conditioned rooms offer full bathrooms, balconies and television. There’s always something going on at the Santa Monica and our entertainment team are at hand during summer months with activities to suit all the family.